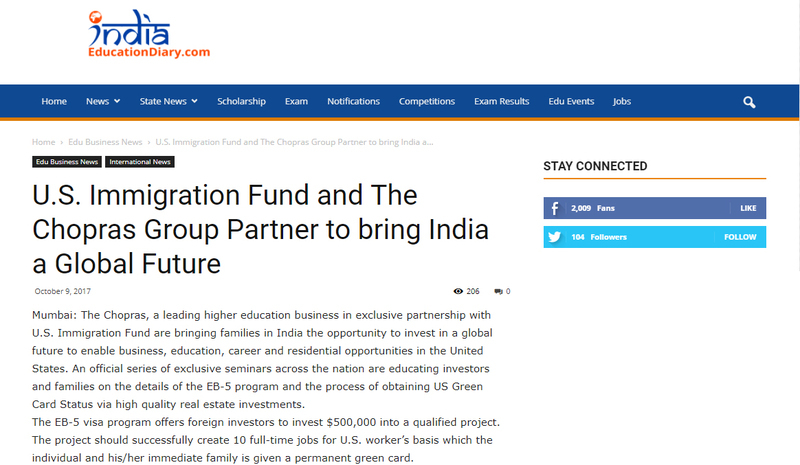 The Chopras, a leading higher education business in exclusive partnership with U.S. Immigration Fund are bringing families in India the opportunity to invest in a global future to enable business, education, career and residential opportunities in the United States. An official series of exclusive seminars across the nation are educating investors and families on the details of the EB-5 program and the process of obtaining US Green Card Status via high quality real estate investments. The EB-5 visa program offers foreign investors to invest $500,000 into a qualified project. The project should successfully create 10 full-time jobs for U.S. worker’s basis which the individual and his/her immediate family is given a permanent green card.